Zombie fiction has been (ahem) clawing its way out of the horror niche for some time now. Of course, being a fan of the original niche, I started out enjoying the resurgence in zombie-themed work. In the last ten or fifteen years we’ve had Max Brooks’s World War Z novel, Robert Kirkman’s The Walking Dead comics and the solid TV adaptation on AMC, Valve’s Left 4 Dead video games and Capcom’s Dead Rising, plus newer zombie films like Shaun Of The Dead and 28 Days Later, the Zombicide board game, et cetera. But even for a zombie-nut like myself, the sub-genre and its trappings have reached kind of a saturation point. Which is why I initially had no intention of even trying to write a zombie story. Perhaps that’s why when I first thought of a person who—for reasons—was either unpalatable to a horde of flesh-eating undead or perhaps basically invisible to them, I almost rejected the idea out of hand. It seemed like a comedic notion, for one thing, and I’ve seen enough “funny” zombies to know that it’s not any more fresh than regular scary zombies. But then I started thinking about how if there was someone surrounded by the living dead, they’d basically be alone even if it felt like there were all these bodies around. So I shifted gears a little and rather than have the character be the catalyst for the zombies not posing a threat I asked what would happen if a zombie apocalypse came except it wasn’t some virus or voodoo or anything and in fact the zombies weren’t a threat at all. I imagined the loneliness of being around all these things that looked like people but they didn’t seem to even know you existed. And, of course, being somewhat socially awkward, I realized I didn’t have to use too much imagination to picture this scenario at all. So I had a metaphor that felt somewhat fresh in terms of the zombie trope, but I needed a bit more tension to pull an actual story out of it. I had been thinking about some bits of data I’d been seeing related to the aging population and the fact that puberty is happening at earlier ages which gave me the general impression of humanity becoming this childless, undying entity. So I stretched those ideas out and stitched them into my non-threatening zombie concept to create the setting for this story I wanted to tell about loneliness. When I sat down to write it, it was one of the first times I did so without a title in mind. I made my narrator/protagonist a rural farmer because it helped to solidify the fact that he was initially unconcerned with the developments of undead and a barren population. It seemed more poignant to have someone who maybe initially reveled in the forced isolation realize what that truly meant. I gave him a family because, injecting the requisite autobiographical note, I often think of myself as struggling in social contexts but I rarely feel lonely as long as I have my immediate family near. Plus, it provided the perfect hook to tear him down to his tragic low. 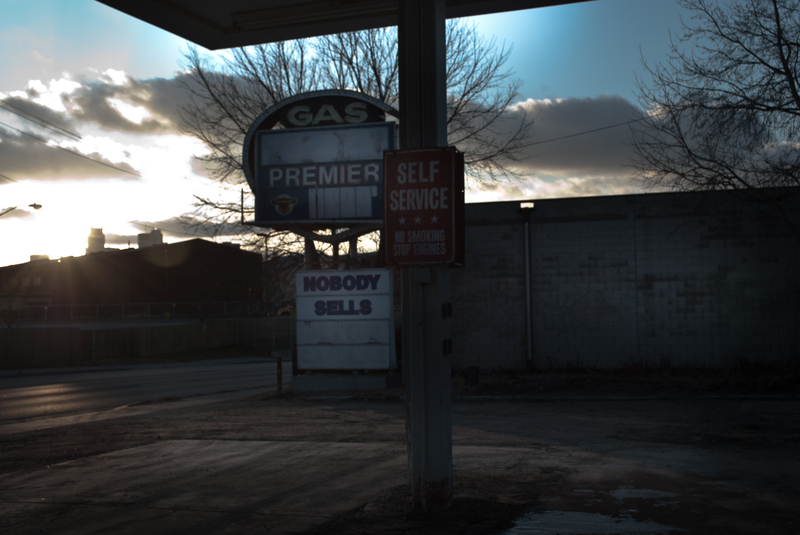 I wrote the scene with the gas station just as a beat before the sad event that informs the second half of the story, but thinking about the often-seen phrase “Self Service” really turned the page for my theme. I mean, at least in most of the places I’ve traveled, the term self service is kind of an anachronism. Full service fuel stations don’t even really exist anymore. They have self-checkout lines in grocery stores and hardware shops. Food is packaged to serve the individual and social conventions have us keeping everyone who isn’t well-known at a minimum safe distance, making sure there’s an empty seat between us in theaters and space behind us in lines. I finished the story in about an hour. I spent the next week or so workshopping, revising, and polishing it up. Then I submitted it to a market I had only recently discovered, T. Gene Davis’s Speculative Blog (since moved to FreeScienceFiction.com). In less than three weeks Mr. Davis responded with an acceptance. A couple of days later we had the contracts signed and the payment was rendered. Almost one month to the day from when I completed first draft. It’s not particularly common in my admittedly limited experience, but this was the fastest I’ve been able to churn my imagination directly into compensation. It was a wonderful, thrilling experience and I’m delighted to be appearing on Mr. Davis’s site. If only they were all this easy.